Reposting due to scammers having too much time on their hands to waste...stop wasting mine! 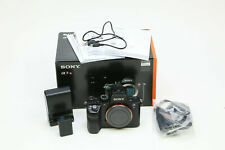 Sony Alpha a7R II 42.4MP Body With Extras. I am selling one of my favorite cameras of all time. It is in excellent condition and the body looks almost new and the sensor is perfect. Included is the original box and manuals, a think tank strap, two batteries and a charger. The only reason I am selling is because I’ve got multiple and this is the nicest one. Sony Battery. The screen is scratch-free. 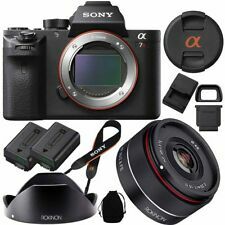 Sony Alpha A7RII Bundle in GREAT CONDITION, with 3 Batteries and L-Plate. Condition is Used. 1 OEM Sony Battery, 2 RAVPOWER batteries. Includes original sony charger and sony cables. Also includes an L-Plate bracker custom made for the a7rII as well as a USB battery charger (great for travel!). The camera does have a screen protector on it as well. It only has 3870 Shutter actuations. It is in near mint condition EXCEPT for two small dings on the right front corner where it was banged against a concrete wall. Everything else is in perfect condition and works as intended. Sony Alpha a7R II 42.4MP Digital Camera - Black (Body Only). Condition is Used. Shipped with USPS Priority Mail. I’d probably rate this a 7.5 to 8/10. Has some scratches and scuffs on it. I scratched the screen one day on a shoot (pictured) and then I put a glass screen protector on after that. Functionally, it works great. No issues. Just been used a little :) Comes with just the body, charger, and 2 genuine Sony batteries. Sony Alpha a7R II 42.4MP Digital Camera - Black (Body Only). Condition is Used. Shipped with USPS Priority Mail. Which is very good to have for these cams. Original Sony box and manuals. I checked the shutter count & it's at 20k currently which should not be a problem as these A7Rii are rated at 500,000 shutter life by Sony. Works perfectly and takes amazing pictures and video. Feature: Weather Sealed, With Image Stabilization, With Video. 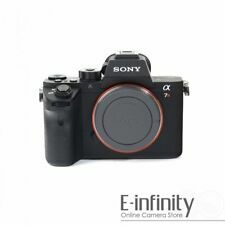 Sony Alpha A7R II 42.4MP Digital Camera - Black (Body Only). Boxed with everything you see on the pictures (apart from the Artisan & Artist strap). It comes with 2 x Sony batteries (not third party). This is a lovely camera that is in great condition having seen only amateur use. There is one small nick on the side of the tilt rear LCD, this is only on the frame and is very small, the LCD has alway had a protective screen on it. I have cared for the camera from new and have decided to sell as I am just not getting the use out of it and my eyes have started to look at a camera with a red dot :) If you have any questions please do ask, I do ship overseas so bidders welcome! See my other Sony items listed. Low shutter count and in great condition. - 1x Really Right Stuff L Bracket. - 3x Sony batteries. And other misc accessories (including cleaning wipes, brush, shoulder strap). Condition is Used. One owner. Fototech remote shutter release with pouch. English instructions only. Unused neck strap. Condition is Used. Shutter count 7683. l fell in love with the auto-ranging ISO. Type Mirrorless Interchangeable Lens. Condition is Used. Includes a second battery. Only sporadically used for amateur photography. Thus there is no point in repeating them here.Will only discuss the condition of this particular unit and what is included in the sale. -Original Sony body cap. Sony A7RII Body. Shoulder Strap. Never re-use a box that has been structurally compromised. Sony Alpha a7R II 42.4MP Digital Camera - Black. Condition is Used but in great condition. Tamron 28-75 2.8 included Sony 50mm 1.8 included Comes with camera bag and SD memory card 32gb Charger and battery included Will come with original boxes. The hot mirror has been removed. You can add any IR/UV/Visible filter depending what you want to shoot. The website I used in the past to check the shutter account seems to be no longer online, however I would guess it to be around 15,000. This sensor design both improves low-light operation and speeds up data throughout, enabling fast high-resolution stills and UHD 4K video recording. Professional Camcorder. Camcorder Kits (Body \ Lens). Used in perfect working order. It has traveled to Portugal, Spain, Italy, Iceland, New Zealand, Tanzania, and even to the top of Mount Kilimanjaro. It has shot most of the world's Top 100 Trance DJs and has under 108,000 shutter releases (~20% of rated life). High resolution is further enhanced by 4K movie recording featuring full pixel readout without pixel binning. Expand Flexible Spot - If the selected AF point is not positioned on your subject, the a7R II automatically uses AF points surrounding the selected point to support precise focus. This sensor design both improves low-light operation and speeds up data throughout, enabling fast high-resolution stills andUHD 4K video recording. The structure combines gapless on-chip lens design and AR (anti-reflective) coating on the surface of the sensor's glass seal - with no low-pass filter - to dramatically improve light collection efficiency, even though the pixels are smaller than the ones in the a7R. It is against the law. It's normally faster, but lets play it on the safe side! We CAN NOT mark your item as GIFT. Los Angeles. San Francisco. Sony Case with Lens Hood. First year warranty still valid. and all original Sony accessories. Universal Flash Diffuser. Soft Box Flash Diffuser. The internal IR cut filter has been removed and replaced with a 720nm longpass filter. This filter blocks almost all visible light and allows near IR and IR light to be recorded by the CMOS sensor. 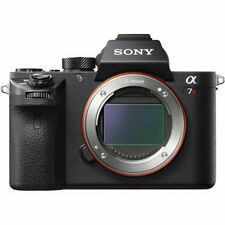 · The Sony A7R II body with the latest firmware preloaded and exhaustively tested. 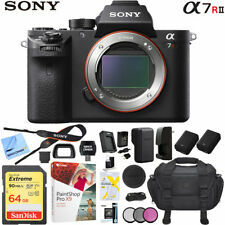 Sony Alpha a7R II 42.4MP Digital Camera - Black with accessories. Condition is Used. Shipped with USPS Priority Mail. Sony Alpha a7R II 42.4MP Digital Camera - Black (Body Only). Comes with charger and batteries. Shipped with USPS Priority Mail. 1 Zeiss Sonnar FE 1.8/55 ZA Lens. 1 Authentic Sony Lens Cap. 1 Sony Lens Hood model ALC-SH131. 4 Authentic Sony batteries.